You may think of the delicious banana-like fruit when you hear the word “plantain”, but do you know about this great healing herb? Plantain is a “weed”, with over 200 different species. Users for thousands of years, it is often thought of as a skin healer. Used properly it can help heal wounds and infections, and other skin problems from minor cuts through to eczema and bad sunburn. It is nature’s first aid kit – and it’s probably growing in your back yard. Plantain is easily spotted. It usually have several flat wide leaves in a circle and, growing from the center, two or three long stalks. At the end of each stalk are the seeds. Plantain HEALS ON CONTACT. The leaves of the fresh plants can be crushed and made into a mash which is applied to burns and wounds. This is called a poultice. Plantain works against infection, inflammation, and bacterial germs. It speeds up healing and stimulates the growth of new skin cells. 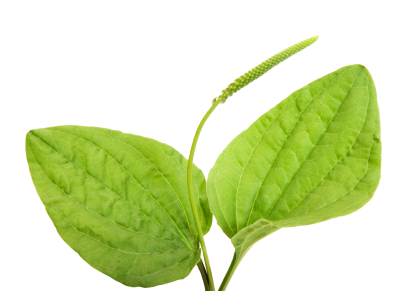 Plantain leaf poultices are soothing for skin rashes, dry skin, bug bites, blisters, and the list goes on. If you want to have a nourishing and healthy drink, Plantain is a great addition to your tea cupboard. It’s important to buy good quality, bulk, and preferably organic Plantain. This infusion is great for upset stomachs and occasional diarrhea, as well as a natural healing drink for edema or sore throat. In addition, you can use the cooled liquid as a wash on irritated skin, insect bites, and rashes. If you want to use Plantain on a burn or an insect bite, it is best to use fresh Plantain. Put this in a pot and let it steep for 2 hours (even overnight is fine) or so. Keep it covered. When it is cooled, it will be dark and murky, and a little bitter. You can drink it straight or mix it with more water and a little honey to improve the flavor, but you should drink it strong. Do not keep this for more than 24hours. Disclaimer: Plantain is a healing herb and is very often found right in your back yard or in parks. While it is fairly easy to identify, if you are not familiar with Plantain, picking and using the wrong herb can actually make you very ill. Consult an expert in plant identification before ingesting ANY unknown herbs or plants.